Juno Space Probe Is Set To Enter Jupiter's Orbit On Monday : The Two-Way The craft is designed to glean data from Jupiter that could also help us learn how Earth formed. But first, Juno has to get into orbit — determined by a crucial half-hour of firing by its main engine. Launched from Earth in 2011, the Juno space probe has nearly reached Jupiter. If all goes as hoped, the probe will repeatedly dive between the planet and intense belts of charged particle radiation, in an orbit that will take it from pole to pole. After a five-year journey through the solar system, NASA's $1.1 billion Juno mission is set to begin its orbit around Jupiter on Monday. But for the probe to be captured by the giant planet's gravity and go into the desired orbit, Juno's main engine has to fire for 35 minutes. "We've only got one shot," says Guy Beutelschies, director of space exploration systems at Lockheed Martin, the company that built and operates Juno. "If we miss this flyby, we're assuming the mission's over." That means for about 35 minutes Monday, scores of scientists and engineers will be biting their nails, crossing their fingers and staring at computer display screens, hoping the decades of work to design, build and launch this ambitious mission won't have been in vain. Assuming all goes smoothly, Juno will provide a lot answers to questions about Jupiter. Although it's well-known that the gas giant is made up primarily of hydrogen and helium gas, the planet's core remains mysterious. "Deep inside, there might be a core of material like the Earth is made of," says Jonathan Lunine, a planetary scientist at Cornell University and one of the scientists on the Juno mission. "How big it is, is anybody's guess." Juno should help reveal that. It should also help reveal a lot about the other planets in our solar system, including Earth. Lunine is interested in one particular measurement the spacecraft will enable scientists to make: how much water Jupiter has. Some scientists theorize there was a lot of water floating around in the outer solar system when Jupiter was forming — water that ultimately showed up on Earth, too. But maybe that's not how it happened, Lunine says. "We might find that water is very depleted in Jupiter," he says. "And maybe water was relatively rare in the outer solar system, in which case it would lead to a big question mark as to where the Earth got its water." But before Juno can collect the data Lunine and other scientists are looking forward to, the space probe has to get into orbit. Beutelschies says Juno will be traveling extremely fast when it reaches Jupiter — more than 130,000 mph. Although the firing of its main engine Monday will only slow Juno by about 1,000 miles an hour, "that will be enough for Jupiter to capture us in its gravitational field," he says. Even if everything goes well, orbiting near Jupiter is hazardous. The planet is surrounded by powerful radiation that can fry any spacecraft that comes too near. "Once we get into orbit, the timer is ticking," Beutelschies says. "We know eventually the radiation is going to damage the electronics." So mission scientists have had to come up with a plan to minimize Juno's exposure to those radiation belts. "We skim over the clouds, and we duck under the radiation belts, and we go from pole to pole," says Fran Bagenal, a planetary scientist at the University of Colorado, Boulder who is part of the mission team. During these close passes, Juno's instruments will be collecting and storing data. But the space probe will spend only part of each orbit near the planet. After each close-up look, Juno is scheduled to scamper off to safety in a long, looping orbit that will bring it back to Jupiter weeks later. Once all the data have been sent back to Earth, "we sort of recover," Bagenal says. " 'Phew, we survived that one. Let's see if we can do it again.' Trim the orbit a little bit, and then come back, and then zoom from pole to pole again." 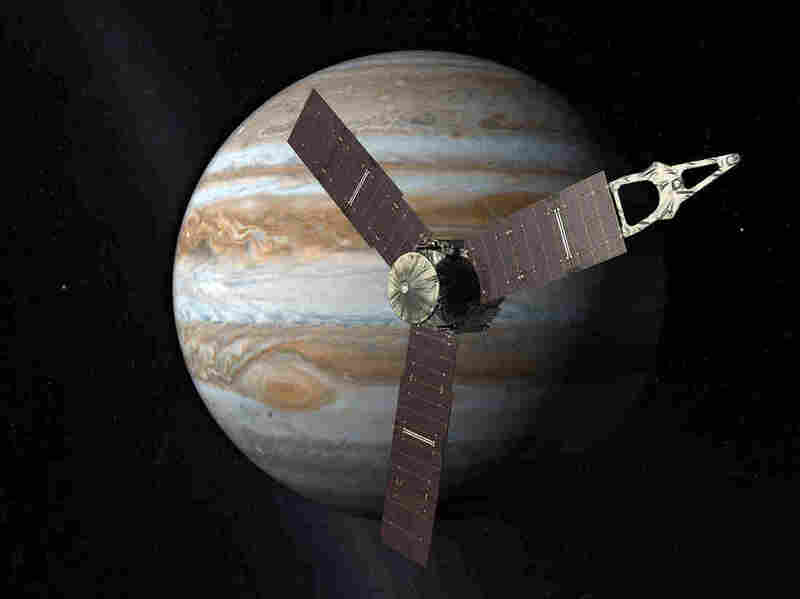 Juno won't orbit Jupiter indefinitely. Mission managers expect they'll get about 30 orbits before the planet's radiation starts to take its toll on the spacecraft. And rather than risk losing control of the probe and having it crash into one of Jupiter's icy moons — moons that NASA hopes to someday explore for signs of life — mission managers will send Juno plunging into Jupiter, where it will be swallowed up without so much as a hiccup. It's not surprising that a planetary scientist such as Bagenal is excited about all the information Juno will provide about Jupiter. But she thinks there's something in this mission for all of us. "I think we all want to know where we came from, how the solar system got to be the way it is," she says. "And the key to that is understanding Jupiter." In the coming weeks, Juno should start providing some answers.